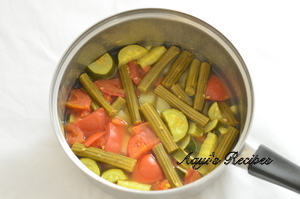 Kolmbo is one of the most popular dishes of North Canara, a traditional Konkani Sambar. My Aayi makes delicious Kolmbo. 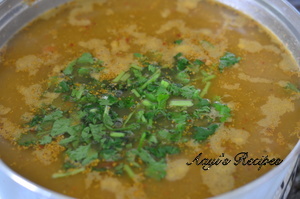 This is my all time favorite sambar. When I was a kid, I used to ask for this dish almost 3-4days a week. All others in the home got so bored of it that, they all used to object when I asked for this. I used to eat it continuously for 2-3days. Now, my husband is a huge fan of this dish. So I can make and eat it for days. Usually this is served with rice. But I think this can also be served with idli or dosas. I advice everyone to taste this atleast once, I can bet you will love it. Cook dal with a pinch of turmeric and drop of oil. Cook vegetables with little salt. Heat oil and fry spices. Then add curry leaves, red chillies, coconut. Fry for few minutes. Add cooked dal to vegetables. Add ground paste to dal-vegetable mixture. Mix well and add coriander leaves. Let it cook. Heat oil in a small pan and add mustard seeds. When they start popping, add curry leaves, asafoetida. Pour over salmar. Garnish with coriander leaves. A Konkani sambar loaded with vegetables, freshly ground spices and coconut. ½ tea spn tamarind extract or a small piece of tamarind. 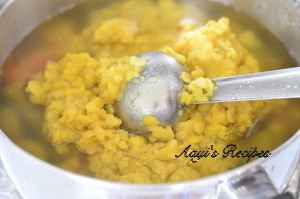 Cook dal with little turmeric and 2 drops of oil (turmeric and oil help dal to cook fast). Cook vegetables separately (I add little salt while cooking vegetables). Heat 1 tspn oil and fry ingredients from chana dal to red chillies. Add coconut and fry for 2-3 minutes. Grind to a thin paste along with tamarind. Heat cooked dal, add vegetables, ground masala and salt. Add half the amount of coriander leaves while cooking. Heat 1 tspn oil. Add mustard seeds, when they start popping, add curry leaves. 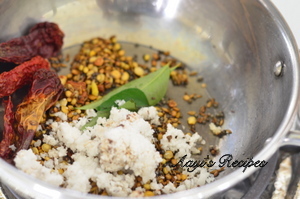 Add this seasoning to the cooked sambar. Hi, I’m originally konkani/marathi (my family is from karwar and bombay) and I would love to link to your blog off of my site. Great recipes! I found you because my parents are in India right now and I was googling for pink kadi (made out of those sola). first time visit here and i must say, i absolutely love your recipes. shall try out this one asap and give you a feedback. I love this recipe. I think it will yield the udipi sambar taste ‘coz of cinnamon and cloves. Thanks for this recipe. 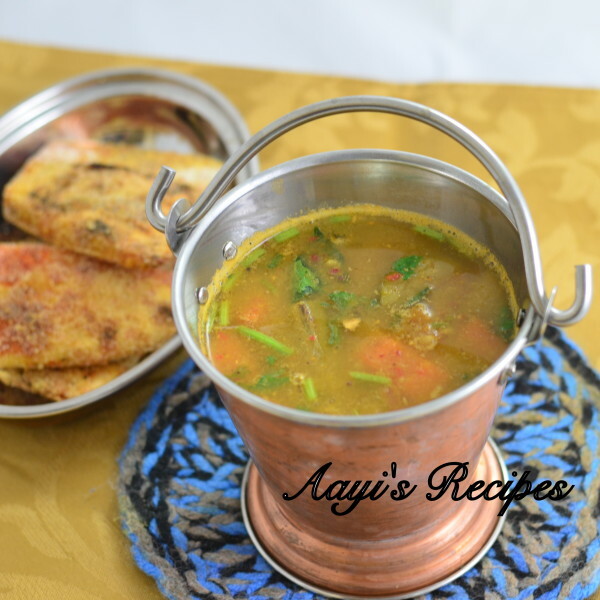 This one sambar recipe is for me to try out. I have been looking to recreate that udipi restaurant sambar taste forever and so unsuccesful. If you have eaten Idli Vada Sambar in Samhrat (Racecourse road) in Bangalore, you will know what I am talking about. Though I loved Kolmbo very much when my mother prepared it, I never had recipe for this one.Thanks for posting it.I tried it over the weekend. Even my husband & son who usually don’t like coconut in any daals loved this one. Shilpa, I made your kolmbo recently and we loved it. Even my 7 year old, who normally does not like anything with coconut in it, loved it. I added some tamarind concentrate to adapt it to our tastes. Thank you for this wonderful recipe! batata sasam goes well with kholmbo.try it. Vidya, I don’t know how Udupi sambar/kolmbo is made. But this is a traditional Kolmbo recipe from NK. Everyone follows the same thing except one or two changes according to their taste. Turmeric does not affect the taste in anyway, it helps in cooking the daal faster and it is very good for health. So we include it in all daal dishes. 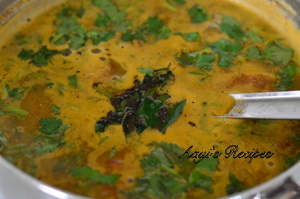 We make the sambar without coconut also. The sambar powder which we use for it is here. I will be happy to try your recipe, so do send it to me. Hey shilpa.. nice to see asamabr recipe…. this is arachu vitta sambar (ground sambar) there is another instant sambar recipe which tastes good and is fast to make…hey iam sorry about the proportions…. i do it by sight value….so plz try and work wt best suits ur taste. any kinda vegetable u like..i wud tell about shimla mirchi here. 1 big or 2 small. Firstly soak the tamarind in water and squeeze out the pulp… add somemore water and let this tamarind juice boil. in a cooker keep dal seperately and cook(when making sambar with vegetables like tomato, aloo, brinjal and so on u can keep these vegetable along with the dal and steam in cooker.dont keep drumstick in cooker as it gets mashed..). Now take a pan put oil in it and slightly fry the shimla mirchi pieces in it. (this is optional but frying the pieces give extra taste. )after it is fried add the pieces to the boiling tamarind water. add salt, turmeric,hing and sambar masala to this water and let it boil well….when u see the water reducing… add the cooked dal to it add sALT and let it boil it it thickens a bit and the dal gels with the tamarind..
Shilpa: Shubha, do try homemade sambar powder next time you make your sambar. It tastes great. This powder can be saved for 4-5months in airtight container, turns out better than any ready made ones. And yes, I too make this sambar very often. for making onion sambar.. u need to fry the onion.. just like shimla mirchi and u need to add a bit of jaggery to the sambar…. Shilpa: Didn’t try adding shimla mirch and jaggery to sambar before. Will try it soon. Thanks. This was so tasty and spicy! What a wonderful recipe! Shilpa: No Nitin, we add them for the paste. It gives a very nice aroma. This kolmbo in very special at our place. In tadka also we add these two. 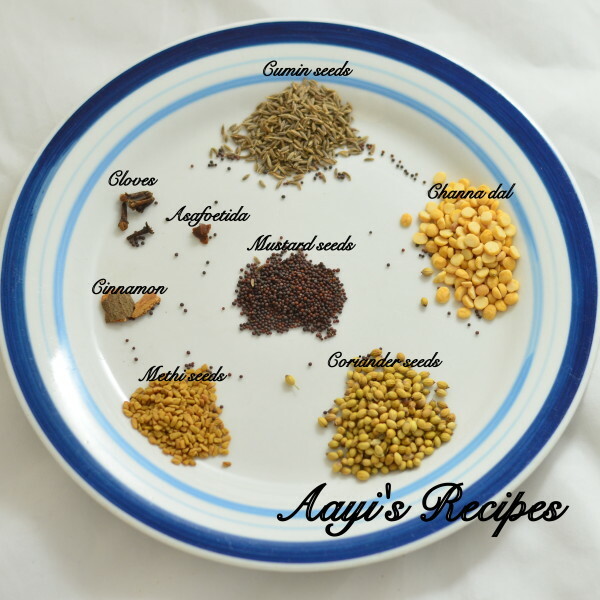 Shilpa, your website is like a magic box, I come across one wonderful recipe after another! What can I say?! I have been looking out for the kolombo recipe since a long time. My hubby’s aunt had made it when we had visited her and i had lost the recipe. My hubby often asked for it and I had no idea how to make it. I am so happy I finally found the authentic recipe right here on your blog. Thanks so much. I must say, this is a very well maintained blog with authentic konkani recipes which are so hard to find. Keep up the good work. We are a group of forced bachelors away from our homes in Bahrain and believe me your website is really a boon because we are now able to cook home-style food and love to experiment though some of the ingredients are not easily available in the area which we live. Nevertheless keep up the good work. You are an angel. powder them and store in an airtight container. I use this powder for sambar powder, bisibela bath, brinjal potato subji, pulihore. Kolombo is my all time fav. …..happy to find this recipe here…. i am also a great fan of Kolmbo. Thanks for this amazing recipe. I will be trying it out soon. Am a great fan of your website and have tried many of your dishes. They have always been a success. hi shilpa(cooking encyclopaedia),i find wat i want to in ur site,now i dont ask anyone if i have any doubts,i refer ur site rt away,i keep quoting u wen some diff in opinion arises regardin some ingredients or method,n thanks for kolmbo,i’mmakin it today..
hello shilpaji how r u? pl.put on your snap. iwant to talk with u . u r really very nice cook. do u make some koftas like mix veg paneer kofta in yellow gravy………new creavity i wait 4 this……..once again i m big fan of your receipes n u. nice 2 meet with u. i wait 4 your reply…………gujju ekta patel …………. 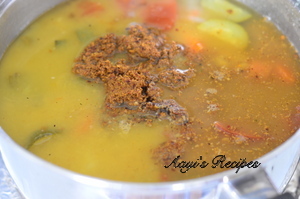 I think you have missed out tamarind in this recipe….. We use tamarind when we make kolombo…. and it’s my favorite too…. absolutely love it with idlis, rava dosas, rice…n et al. Anu, I normally use one souring agent in a dish. Either tomato or tamarind. Here since I mentioned tomato, I did not mention tamarind. I think I will update the post with that. Hi Shilpa,,, I love your receipes…. you know what… I am from Maharashtrain family… and my husband GSB (south canara)… your receipes help me to impress him…. i learn almost all konkani receipes from you… really thank you so much…. madam,thank you for the reciepy.But, this is not a traditional kolmbo which has been prepared at uttarkannada.What i need is typical kolmbo with brinjal . also the reciepy dry kolmbo masala.Pl we are eagerly waiting to know the reciepy of kolmbo with brinjal only.Please.Thank you. Awesome recipe…. My husband loved this. Now this sambhar is a regular in our home. I am assuming you are asking about kolmbo pitto? You can use the dry ingredients and use dry coconut in about recipe. Instead of making a paste, make into dry powder and store. 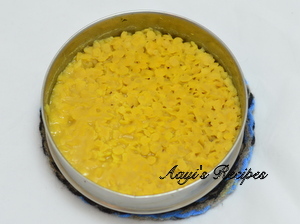 While making kolmbo, follow same recipe and add the pitto instead of ground paste. This is authentic Karwari GSB recipe. Mom has made it for me over the years. Now I too make it. Only difference is that we use black pepper and not cumin and we boil potatoes and drumsticks and not the rest of the vegetables. I too like it more with potatoes. Also we add a little jaggery. Rest of ingredients are the same.